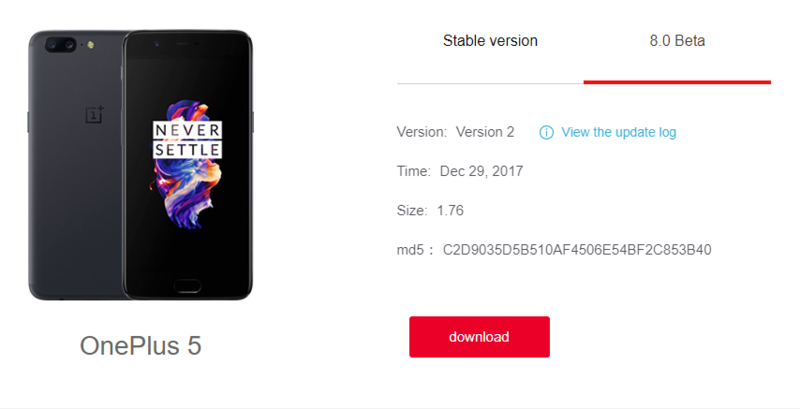 Update: Oxygen OS 5.0 Open Beta 3 for OnePlus 5 now available for download based on Android 8.0 Oreo along with Hydrogen OS latest beta as well. This is the week for OnePlus. If you have been following the manufacturer’s update lately, then you must know that all of their devices are now being updated. It started with official Oxygen OS 5.0 for OnePlus 5. Later they moved onto releasing a major camera upgrade and face unlock improvement update to OnePlus 5T with the Oxygen OS 4.7.6. Ultimately we saw the next big Open Beta 29/20 update for OnePlus 3 and 3T. Now, the OnePlus 5 is getting the latest Open Beta update which includes the new Face Unlock feature. This means that Open Beta 3 for OnePlus 5 will possess the new Face Unlock feature from OnePlus 5T. The update actually comes to Hydrogen OS (H2OS ROM) under its public beta program. As we know, H2OS is a parallel ROM to Oxygen OS, developed for the Chinese variants of OnePlus phones. the firmware is same as that of the global variants except, H2OS ROM voids of all the Google apps and services. Moreover, H2OS development is always a day ahead as compared to OxygenOS. Hence, as the latest HydrogenOS brings face unlock, new Oxygen OS Open Beta 3 for OnePlus 5 will surely possess the same update log. Recently, OnePlus along with the founder of the company, Carl Pie, asked their customers whether they would like the new Face Unlock feature. Responding to the immense response, the manufacturer decided to bring the same to OnePlus 5. Plus, Carl has also asked OnePlus 3 and 3T users if they would like the smart unlock or face unlock feature from the OnePlus 5T. According to this post in the official OnePlus forums, the face unlock feature has been confirmed coming to OnePlus 5. On the contrary, there are several new upgrades coming to the device including optimization to the vibration motor, fixed some issues with 5G Wi-Fi, general bug fixes, and stability improvements. The changelog has directly been translated using Google. So the transcript may not be accurate. As the update is now live, the OTA download links are not available for Oxygen OS. We will update it as soon as available. Also, the update will be live at the following URL. Moreover, there have been several leaked Open Beta updates for the OnePlus 5 lately. We have seen face unlock feature just like OnePlus 5T. See the latest leaked beta update for OnePlus 5. Not to forget that Open Beta program started for OnePlus 5T.